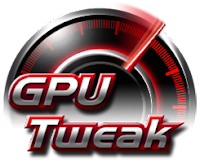 GPU Tweak allows you to optimize clock speeds, voltage and fan speeds on up to four graphics cards independently or simultaneously, you can also select between GPU Tweak’s Standard or Advanced modes depending on your level of experience. ASUS makes serious hardware for die-hard overclockers who want to squeeze every ounce of performance out of their gear and never back down from a challenge.This experience is enhanced further with the all new and intuitive ASUS exclusive GPU Tweak utility - allowing you to monitor and optimize settings for ultimate performance on any graphics cards. ASUS GPU Tweak was introduced back in the summer of 2011 as the ASUS homegrown application software for overclocking graphics card adapters. Since then, it received more than twenty-five updates focused on increased compatibility and extended support for the newly introduced series while constantly trying to infiltrate the community by competing with the mogul: MSI Afterburner. It is now utilized in the overclocking process of ASUS cards that are being reviewed by most of the popular and well-established websites and it seems to be doing a fairly accurate job in the tedious task of tinkering with not one but many characteristics. As an actual example, it helped an ASUS GTX 660 DirectCU II achieve a GPU clock frequency of 1098 MHz over the stock clock of 1020 MHz and a Top GPU Boost of 1228 MHz over 1150 MHz. In terms of memory frequency, ASUS GPU Tweak made it possible for the overclocker to reach 6608 MHz, thus squeezing 600 MHz and add them to the stock clock. ASUS GPU Tweak features a pretty neat interface, although it may seem a bit quirky at first. It does not take much for you to get accustomed to it, though and you can find yourself immersed into its depth as the overclocking process gets underway. We believe that, as long as you spend the time to download and install ASUS GPU Tweak, you are aware of all the risks this operation involves and proceed with caution and good use of a solid knowledge. This particular application allows you to modify the GPU Clock according to the GPU Voltage or even separately, the Memory Clock as well as the Fan Speed. You can also set the fan speed by linking it to the temperature, thus creating a customized graph, make use of the 2D / 3D switcher, sync all the available cards as well as set up profiles. All in all, ASUS GPU Tweak has come a long way since its release and started making a name for itself as a reliable companion for a far from risk-free operation. While many would still recommend MSI Afterburner to be used with any graphics adapter, ASUS GPU Tweak can prove to be a worthy alternative, especially when the card at hand is, indeed, an ASUS.